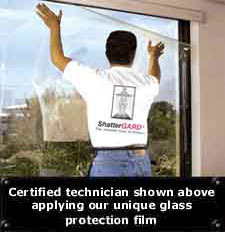 Window & Glass Protection Films By ShatterGARD. Available In Your Hometown!! The ShatterGARD Company protects people and property worldwide by offering a variety of unique security services and products. Our unique window films not only beautifies your home or business, it also defends against burglaries, mother nature and bomb blasts. 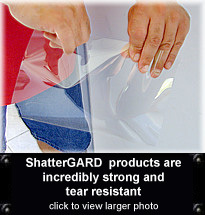 Wherever glass protection is required.. you can bet ShatterGARD has a product for you. ShatterGARD markets and installs a series of incredibly strong window films that are designed to prevent glass from shattering. Our unique maintenance-free and highly scratch-resistant products improve the structural integrity of any window. In the unlikely event the window breaks, our film will help hold the broken shards together thus reducing the likelihood of window penetration and razor sharp flying glass. And when applied by an authorized technician, ShatterGARD films are virtually undetectable to the human eye. ShatterGARD films reduce the need for unsightly burglar bars or hurricane shutters. 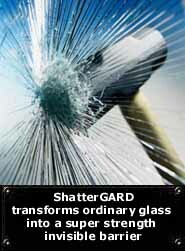 And unlike costly ballistic glass, ShatterGARD ™ products are guaranteed not to yellow or distort overtime. Where are ShatterGARD products available? Our expert technicians can easily and affordably install the family of ShatterGARD products anywhere in the world. In addition, ShatterGARD now offers professional risk and threat assessments for corporate and residential clients. What makes a good window protection film? Essentially there are three important ingredients that will ensure the performance of the product. ShatterGARD is one of the leading and most respected window film providers in the world. All films utilized are subject to stringent testing and carefully inspected prior to leaving the plant. Our firm markets only 1st grade security and safety window films. We are proud to attach our name to such a high quality product. For this reason, ShatterGARD is proud to offer the only lifetime film and labor replacement warranty in the industry. The adhesive is a critical part of any ShatterGARD window film. The adhesive system not only provides the all-important bonding between the polyester film and the glass surface, it also incorporates an invisible ultra-violet inhibitor that rejects upwards of 98 % of the harmful rays that fade furnishings. ShatterGARD window films will only perform to specification if the installation is carried out by an expert installer. Unlike the inexperienced neighborhood window tinter, ShatterGARD technicians must undergo many hours of specialized training to install our security and safety films. Our technicians can apply our window films with absolutely no disruption to your home or business. There's absolutely no mess or odor. How do I arrange for an expert installation? 1. The first thing you will need to do is simply measure your windows. Then provide us with your windowpane measurements and quantities (I.e. 3 windows @ 32` x 77` inches). Measure the glass surface only. It is important that you measure every single windowpane, not just the overall window frame opening. 2. Once you have measured your windows, you should email or fax your measurements to our corporate office. Within 48 hours a ShatterGARD representative will contact you to answer any and all questions you may have concerning our products and services. Our trained representative will also make sure the proper film is chosen for your application and can even arrange for a convenient installation date.